Is the US becoming an economic oligarchy? Recently Cathy published a piece at the Center For a Stateless Society titled “The New Oligarchs,” in which she argues that U.S. economy has become increasingly calcified, unequal, and immobile, with a new rentier class of financial oligarchs. It’s a provocatively pessimistic article, but there are number of points that bear closer scrutiny. It’s not clear if this refers to income inequality or wealth inequality. If it’s wealth inequality, it’s just not clear that this is true. Best-selling data-masseur Thomas Piketty would have you believe so, but the way he picked out his data to come to this conclusion is questionable. You can take the same sources and methods he used and construct a series that shows the exact opposite trend in wealth concentration in the US since the 1970s. But if it refers to income inequality, it is true. The share of income going to top earners is enormous. But the significance of this isn’t obvious. Incomes for the median household and indeed almost all of the bottom 90% have gone up a lot too. The reason is that income inequality doesn’t hurt economic growth; the flexibility that allows large differences in incomes may be required to allow the economic pie to grow for everyone, even if the rich get a bigger share of that new pie. In contrast to the picture that inequality is evidence of a calcified and static structure, it may be evidence of a free and flexible economy. Or, perhaps more likely, it could show a more complex picture: some inequality could be due to institutional distortions that insulate upper class earners and politically favored industries, and most could be due to the growth that comes from entrepreneurial dynamism from a mostly free market. This just doesn’t appear to be true. Unlike with wealth inequality literature, which is plagued by weak data sets and widely divergent estimates, the best and most recent studies on income mobility are clear: Americans today are just as mobile as previous generations. Income mobility has been stable for a long time, both over individuals’ lifetimes and through generations. She’s right that other western countries have higher rates of mobility than the US, but that’s been true for a long time. The US has just as much opportunity — in fact, likely more, given increases in higher education of recent generations — as it has had for a long time. Data from the U.S. Treasury shows that about 50 percent of individual taxpayers who were in the bottom income quintile in 1996 had escaped it by 2005, a rate similar to the previous decade. The Treasury also found that two-thirds of taxpayers’ real incomes increased over that period and that the incomes of those who started in the lower brackets increased faster than those in the higher ones. The real median incomes of taxpayers in the sample increased by 24 percent, but the gain for those who started at the bottom was over 90 percent. Intergenerational mobility has also remained relatively constant over time, perhaps increasing a bit. While the payoff for winning the “birth lottery” (the benefit of being born to rich parents) is larger than it used to be, it’s not true that being born in the lower or middle class dooms you to a poorer lifestyle than your parents. The share of American families in middle income brackets ($25,000-75,000) did decline in the last few decades, but they didn’t fall into the poorest bracket. They “vanished” up. 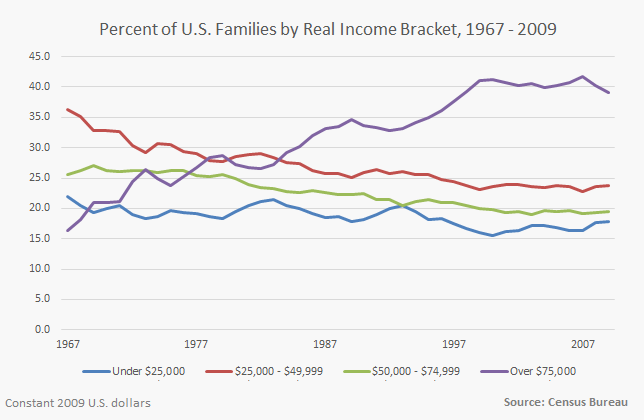 The share of U.S. families earning more than $75,000 (adjusting for inflation) increased from 16.3% in 1967 to over 39% by 2009. This distribution hasn’t changed much in the last decade, but it’s not declining either, as mourning over of the “death of the middle class” might suggest. In conclusion, the bleak picture of America with a hopeless underclass dominated by a exploitative, do-nothing oligarchs just doesn’t square with the evidence. In fact, in so many ways that are hard to measure, life has been getting better for the poor and middle class. Life expectancy is up more than a decade since 1950, in large part thanks to the enormous increase in the quality of almost all the goods and services that we enjoy today, from cars to medical care, while the historic racial gap in life expectancy between whites and blacks is the lowest it’s ever been. Life inequality is going down. Our ability to consume is also up, regardless of what the CPI says about median incomes. The share of income we must spend on life’s “basis” — groceries, cars, clothes, furniture, housing, and utilities — declined from more than half of households’ disposable income in 1950 to just one third today. This has allowed us to afford more luxuries and leisure than ever before, to say nothing of the incalculable surplus value of new technologies like cell phones and the Internet which have created vast new industries and services that people in the “good old days” couldn’t even imagine. It’s important not to downplay the institutional barriers to prosperity facing the poor today, whether it’s the devastation of the drug war, mass incarceration, the permanent stain of a “criminal record” (even for simple arrests or nonviolent offenses), terrible public schools, stifling local regulations and licensing restrictions, prohibitively high minimum wage laws, burdensome middle class entitlements and corporate welfare, and so on. Cathy’s right that “Overcoming the obstacles to upward mobility requires acknowledging them.” But if we seek to expand freedom, mobility, and opportunity, it also requires understanding and recognizing that which we do enjoy, as well as the failures and successes we’ve seen in the struggle for prosperity.